When you’re in need of a tool that’s able to cut through a wide variety of materials, such as steel or copper, what you’re looking for is a plasma cutter. But there’s no reason why you have to spend huge sums of money to find a plasma cutter that’s able to do the job for you. As we’re about to prove, there are lots of fantastic solutions that can be bought for less than $500. We’re going to look at the very best plasmas cutters on the market for that price to see what their key benefits are. You can then survey the options and make an informed decision regarding which of them is best suited to your needs. Read on now to find out more about each of these cheap plasma cutters. 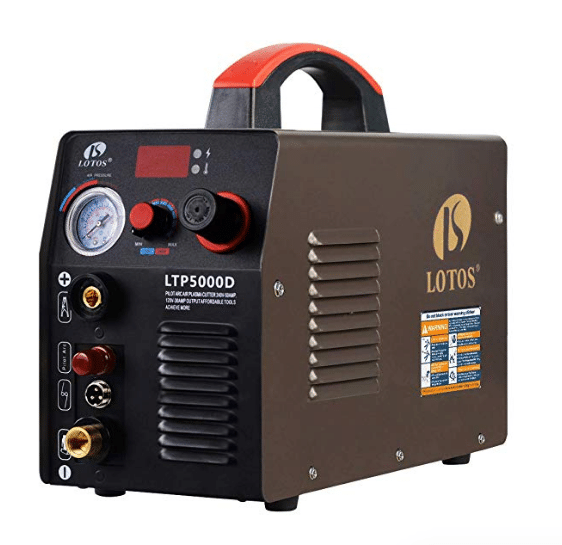 The Lotos LTP5000D 50Amp plasma cutter is one of the most compact and lightweight plasma cutters on the market right now. It’s very good for light cutting jobs and doesn’t require much effort or expertise to use effectively. It might not be ideal for heavy usage but there’s a lot to like about it, so find out more below. The fact that you can pick up and start using the Lotos LTP5000D is one of its greatest selling points. Even if you have never used a plasma cutter before, it won’t take you long to get to grips with it. There isn’t a better cutter out there for complete beginners, and the price point makes it easy to recommend as your very first plasma cutter. As well as being durable, buyers have also noted its durability. Even people who’ve been using it most days for a few years have experienced no problems with it and carry on using it. It’s definitely a durable machine, which not everyone expects considering its reputation as a good option for beginners combined with its affordable price. Another great thing about this machine is how lightweight it is. It takes no effort at all to pick up and carry it to where you need to take it. The compact design was clearly created with portability in mind. It weighs less than 23 pounds, so you won’t struggle to carry it around and the sturdy handle on top makes it even easier to do so. NON-TOUCH PILOT ARC PLASMA CUTTER: efficiently cuts though rough, painted, and rusty surfaces and produces minimal slag. Pilot arc technology allows you to cut without touching the tip to the metal. Better cutting quality and longer consumable life. 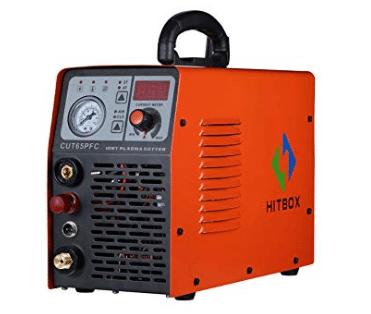 SAFE AND AT LOW COST: compact plasma cutter has a handle for portability and uses non-hazardous compressed air to cut stainless steel, alloy steel, mild steel, copper, and aluminum. OUTPUT & PERFORMANCE: 10-50 A DC output, 1/2" ideal clean cut and 3/4" maximum severance cut under 220/240V. 10-35A DC output, 1/3" ideal clean cut and 2/5" maximum severance cut under 110/120V. SUITABLE CUTTING for Stainless Steel, Alloy Steel, Mild Steel, Copper, Aluminum, etc. Uses non-hazardous compressed air to cut, safe and at low cost. SETUP WITHIN 1 MIN: The pre-installed NPT 1/4" industry type D plug and air filter regulator allows you to quick connect to your air compressor by using the stand coupler existing on your air compressor. The whole machine can be setup quickly within 1 min. 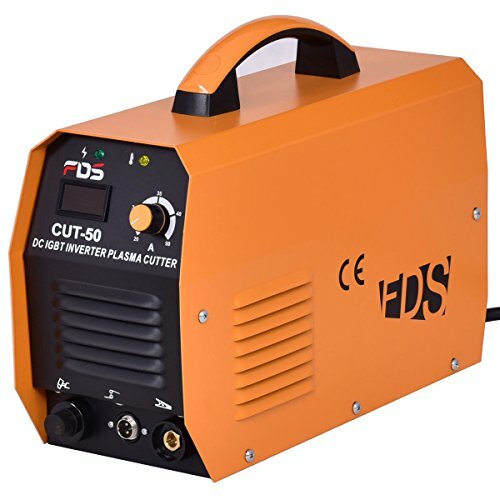 This 3 in 1 multi-functional plasma cutter is ideal for anyone looking for versatility. 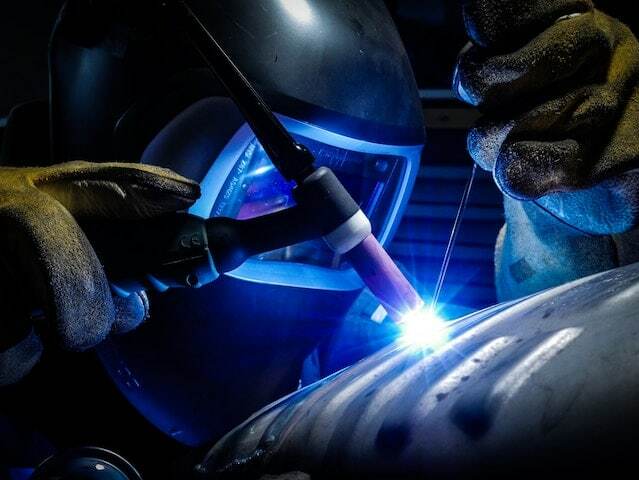 It’s great for all kinds of cutting jobs, as well as offering various welding capabilities. It’s a machine that works for hobbyists while also being suitable for people looking for a more reliable, professional machine as well. Here are its main benefits. There might not be too many fancy frills here, but the VIVOHOME plasma cutter gets the job done without any problems at all. It’s the kind of machine that you can simply rely on to get the job done, no questions asked. That kind of reliable, solid performance is what many people are looking for in a plasma cutter like this. Lots of people who use this plasma cutter use it at home in their garage. That’s because the design, its multi-functionality and it’s easy to use nature make it perfect for home projects. It’s not complicated to use; instead, you can get to grips with it pretty quickly after using it for a while. And then you’ll feel confident using it on a variety of home DIY projects. We all know that it can sometimes be a hassle to have to deal with metal that has a rough surface or that’s rusting. However, this plasma cutter makes easy work of that kind of metal. You’ll have no trouble cutting through metals with rough surfaces, paint or heavy rust on them. It makes light work of just about anything you throw at it. The SUNCOO Cut-50 plasma cutter offers a smooth finish and the ability to cut most of the metals you’ll need to cut. It’s made from a very strong heavy duty iron, providing it with protection and offering you reliability and durability for longer. Read on to find out more about why it stands out from the crowd. The automatic voltage system of the SUNCOO Cut-50 makes it so you don’t have to worry about voltage issues much at all. 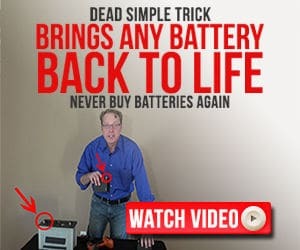 It can adapt to the power output, whether it’s 110V or 220V. This might seem like a relatively small thing but it does make a pretty significant difference when you just want to start using it right away while not risking safety. One of the things that people most often comment on after using this plasma cutter is the clean nature of the cuts it makes. 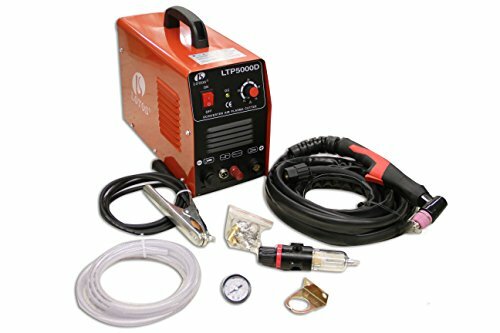 It has a strong reputation for producing cuts that are cleaner and more precise than you might imagine from a plasma cutter in this price range. That’s a big deal for anyone who wants their cuts to be as clean as they can be. This is another very lightweight model that’s easy to pick up and carry around when you need to. It weighs 25.4 pounds, making it one of the lightest plasma cutters you’ll find anywhere on the market right now. That, combined with the price point that makes it one of the most affordable models available, is a compelling reason to consider it. 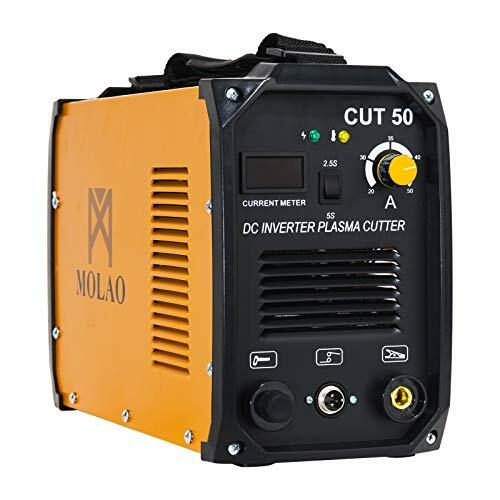 50 Amp Digital Inverter Plasma Cutter- handles cuts up to 1/2", simple operation and smooth cutting surface.Suitable for cutting carbon steel, stainless steel, copper, iron and aluminum metal etc. Made of heavy duty iron. The solid material construction makes it reliable and to be used for a long time. It not only can be suitable for businesses and DIY users, but also fully accommodating the demands of professional operators. DC output Digital LCD Display, Easy Read Front Panel Air-Pressure Guage, save energy and no noise, High cutting speed, Cutting smoothly and no polish demands. Multifunctional Use-The compact plasma cutting machine is suitable for a wide range of applications including sheet metal fabrication, light industrial use, site work, automotive, ducting work, repair and maintenance services. A face mask can prevent you from hurting while working. 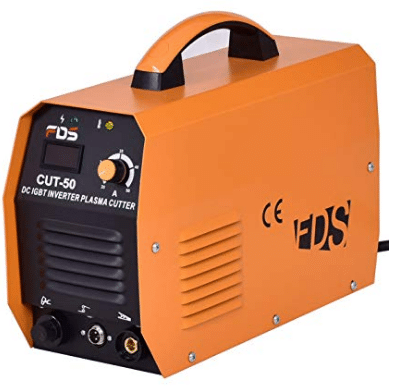 This sturdy and durable plasma cutter is very popular among people looking for a machine that’s going to offer endurance and versatility. It’s great at dealing with all sorts of metals and can be used in all sorts of setting thanks to the way in which it’s built. Here are some of the key qualities that you should know about. When you consider the price of this plasma cutter, the fact that it performs so well and so reliably really is a big deal. Many people who buy this model don’t go into it with particularly high expectations. But it does the job, and it does it very well indeed. So if you’re hesitant about buying a Goplus plasma cutter, maybe you shouldn’t be. The price point attached to the Goplus plasma cutter is extremely impressive. At less than $200, you’re not going to find a plasma cutter of this quality at a cheaper price, that’s for sure. It makes buying one and using it pretty much risk-free because even if it’s not perfect, you haven’t spent much money at all on buying it. Another major selling point of the Goplus is that it’s made to be weatherproof. 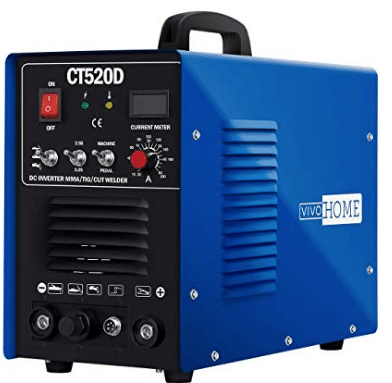 So if you’re planning on doing any cutting outside of a covered area and you want the versatility that comes with that option, this is definitely a plasma cutter that you should be considering right now. It makes outdoor use possible. 【Compact Design】With comfortable handle and compact size, it is easy to operate and carry. And it comes with wire and mask, which can prevent you from hurting while using, it provides extra convenient for your work. 【Multifunctional Use】The cutting machine is suitable for a wide range of applications including sheet metal fabrication, light industrial use, site work, automotive, ducting work, repair and maintenance services. It not only can be used in businesses and DIY users, but also fully accommodating the demands of professional operators. 【High Quality Material】This plasma cutter is made of heavy duty iron. Its solid material construction makes it reliable and gives it strength that can be used for a long time. It is a good choice for the processing of metal materials machinery. 【Efficient Cutter】The plasma cutting is equipped with a high quality plasma torch developed specifically to enhance and improve the cutting quality. Its continuous current regulation, high cutting speed and smooth cutting surface makes your work more efficiently. 【Easy to Assemble and Use】All assembly hardware is included. Clear and brief instruction makes it easier to put together and use. And no professional tools are needed. 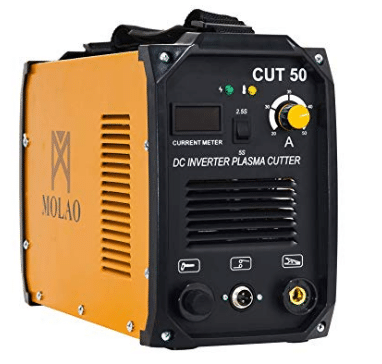 The Plasma Cutter 50A Dual Voltage cutting machine has an automatic dual voltage and dual frequency setup, providing more options to the user. 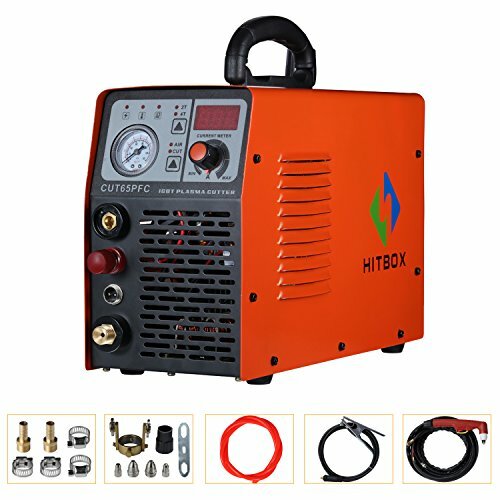 It’s immediately clear that this machine has a very strong build quality, especially for a plasma cutter of this price. Read on now to find out more about the benefits of it. 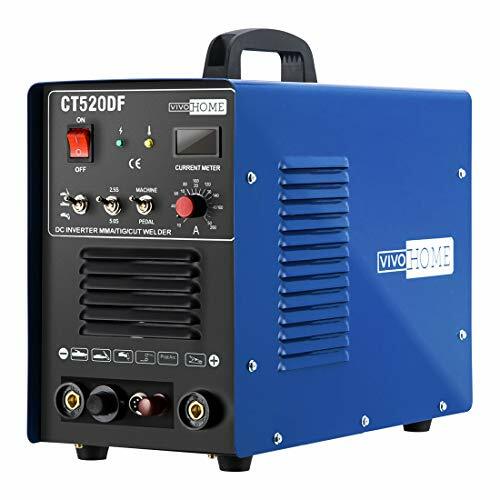 At $459.99, this is far from the cheapest plasma cutter on this list, but it is one that performs to a much higher level than its price point might suggest. It’s a high-quality machine that does just about anything you might expect from a plasma cutter twice its price. It’s a perfect example of why you don’t need to spend a lot to get a reliable cutter these days. There’s a wide variety of metals and materials that this plasma cutter will cut with complete ease. It’s suitable for use on steel, alloy steel, copper aluminum and plenty more metals. The cutting tasks you need to complete will be very easy indeed if you use one of these plasma cutters. Another thing worth mentioning is the very strong safety features offered by this plasma cutter. It has a protection that prevents over currents and over voltage. This is because the electro circuit is very well protected, ensuring your safety when using it. Max Cut Thickness: 1/2" ; Max Severance Thickness: 3/4". With protection of electro circuit against over current, over voltageand low-voltage. Safety in operation is assured. Each of the plasma cutters mentioned above comes with its own benefits. You need to decide which of them you feel best meets your needs. They’re all high-quality, reliable and affordable plasma cutters though, so you shouldn’t be disappointed with whichever one you put your trust in.